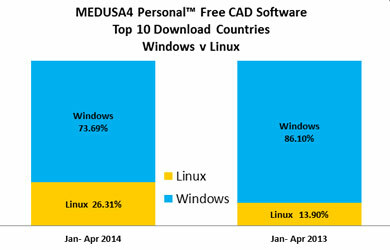 Cambridge, UK and Pittsford, NY – 04 February 2015: After years of an increasing proportion of downloads for Windows, Linux is rallying among MEDUSA4 Personal users. The free CAD system is used by hobby and professional engineers in 165 countries (with a pay-per-result portal for commercial use). 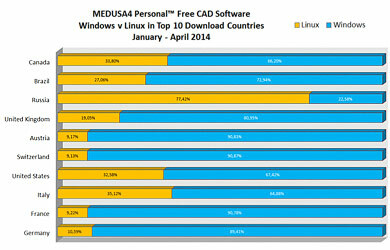 Among the top 10 download countries in the first quarter of 2014, 26.3% of users chose Linux, up from 13.9% in the same period from 2013. 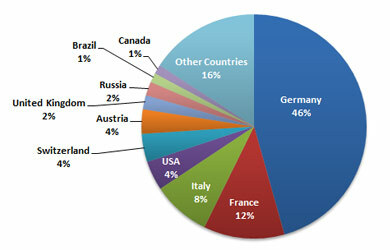 Countries that have seen an increase in the percentage of Linux users include Switzerland (up 48%), France (up 39%), Germany (up 18%), Brazil (up 12%), the United States (up 36%), Canada (up 16%) and Russia (up 18%). In the first four months of 2014, Brazil, with nearly a 60% increase in overall MEDUSA4 Personal downloads compared to 2013, replaced Belgium as part of the top 10 download countries. Brazil is known to be in huge need of engineers for its growing mining, oil and gas industries, as well as infrastructure and communications projects. CAD Schroer’s eSERVICES portal, recently relaunched to accommodate a growing number of services, enables designers to use their work commercially by converting drawings to PDF, DXF or the professional MEDUSA4 sheet format for a small fee , helping many people start a new business. MEDUSA4 Personal includes extensive 2D drafting and editing tools, basic 3D, Parametrics, image integration, and a sheet metal design module, and is available in English, German, French, Italian or Japanese on Windows or Linux.